This blog post was written for school teachers and will hopefully soon be published on a suitable blog site that reaches teacher audiences. It has been put up here to serve as reference for “droso4schools” activities. It describes our first primary school resources and first event on which we tried them out in their final form, accompanied by evaluation. Nature is fascinating. One can easily be gripped by the many natural history documentaries engaging us with fascinating insights into the plant and animal world. My kids can still be tempted to watch them together with us, but would unfortunately not pick them if given a free choice. But isn’t it that the more we know about nature around us, the more we care for it? Can schools be a place where to address this challenge? The two lesson resources I am describing here can help teachers to bring natural history spirit and practical science into primary school classrooms whilst teaching the curriculum-relevant topics of life cycle and evolution. Fig. 1 Some of the insect images used in this resource. For details see our website. The topics of inheritance, evolution, life cycle and ageing are key specifications of the English KS2 curriculum (Box 1). I learned about all these topics during my traditional university biology education 30 years ago. Although I now work on very different areas of biology, those memories still live on vividly, which is why I am convinced of the powerful influence of early experiences. Such prolonged impact seems to work similarly for pupils at younger age (Archer et al., 2012; Croll, 2008; Maltese and Tai, 2011) emphasising that we must care about excellent school teaching of science and natural history. A second incentive for generating these resources comes from my scientific research based on using Drosophila melanogaster, the tiny fruit flies that hover over our fruit bowls in summer (Prokop, 2016). I use these flies for good reason, because more than a century of intense research have made them the animal organism with the best understood biology on this planet (Prokop, 2018b; Why fly?). This unique understanding offers fantastic opportunities not only for research, but also to enrich biology teaching in schools: with (1) conceptually well understood contents (including all topic areas mentioned in Box 1), (2) many relevant examples and anecdotes, as well as (3) numerous micro-experiments that are easy to perform in classrooms (Manchester Fly Facility, 2015). Astonishingly, many aspects of fly and human biology are so similar that Drosophila research has helped us understand many aspects of our own bodies and even human diseases. 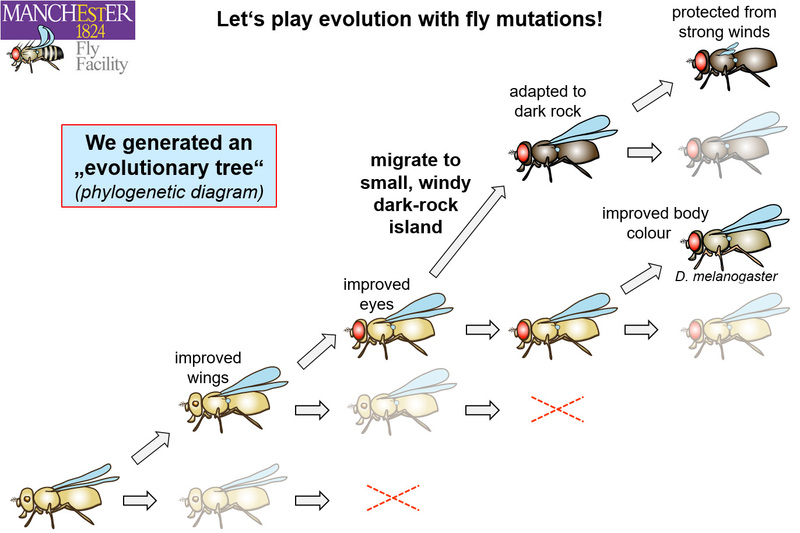 This shared biology can be capitalised on in classrooms: for example by first using fly to explain fundamental concepts to then demonstrate how this applies to humans; or to illustrate the concept of common evolutionary roots (see below). Since we want more people to become aware of the enormous potential of fly research, we launched the “droso4schools” project which actively promotes the introduction of fruit flies as teaching tools in schools. The goal is to improve curriculum-relevant contents whilst creating memorable encounters with flies. Our evaluations clearly show that pupils receive Drosophila and fly-based micro-experiments with great enthusiasm (see our impact document; Fig.11 below). It is for all these reasons that I developed the two lesson resources described in the following. On the droso4schools project, university students work as teaching assistants in partner schools for several months (Harbottle et al., 2016; see our film). Through this close involvement we are able to generate sample lessons where we merge our own expertise on biology topics with the professional expertise of teachers, thus incorporating appropriate styles of teaching including differentiation, as well as contents that address the curriculum and assessments. Our sample lessons form a conceptual journey through curriculum-relevant topics, told in a highly interactive way that engages the pupils. The lessons are spiced up with little activities and micro-experiments that are easy to set up and perform also by teachers. These sample lessons are made freely available for download from our figshare site. They include PowerPoint files accompanied by support materials, such as teacher notes, lesson plans, risk assessments, activity and homework sheets. Importantly, these resources are not static but regularly updated and improved, based on new ideas that arose during our school visits or other forms of feedback we receive. Notably, all contents are also provided as dedicated pages on our “droso4schools” website, which can be used for teacher preparation as well as revision or homework tasks of pupils. So far, most of our experiences are derived from collaborations with secondary schools (Prokop, 2018c), whereas primary schools are new territory for our project. But our first school visits and evaluations were promising, and we felt it to be timely to share our resources – also hoping that members of the teaching community may send us their feedback, advice and suggestions so that we can further improve our lessons. Fig. 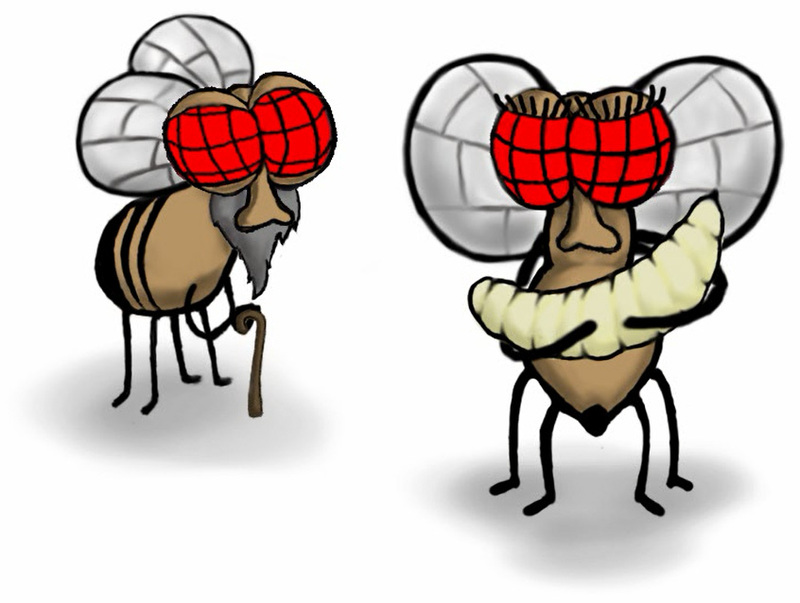 3 An animated image showing the life cycle of the fruit fly Drosophila melanogaster as it can be used and viewed in classrooms. For details see our website. (12) a potential further activity or homework task introduces pupils to the identification of insect orders using determination keys (we use the UC Berkely BioKeys website). The flow of our life cycle lesson is summarised in Box 2, and contents are explained in the wider conceptual context on our accompanying webpage (Prokop, 2018a; see Appendix). Here I briefly discuss some innovative features of this lesson. First, when analysing existing online life cycle resources, I mostly encountered materials with lovely drawings but very few would show the real animals. I therefore took a different approach in that my lessons make prominent use of animal photos. In the life cycle lesson these cover the four known groups of amphibians as well as most orders of insects. Many of these animals are set into context, and engaging background information is provided. We even explain how teachers can extend into an activity where children learn simple and exciting ways to use a determination key to identify animals they might find outside in their daily lives. In sum, these contents and activities clearly address items 1-4 in Box 1, whilst bringing natural history into the classroom. Fig.4 Damselflies (left) and dragonflies (right) belong to the insect order of Odonata and are easily distinguished by their eye sizes (insets), wing shapes (see details) and wing postures in resting position (see main images). Image information: Ischnura heterosticta (inset – same species); Sympetrum flaveolum (inset – species unknown). Second, the use of Drosophila brings new opportunities. For example, observing the full life cycle of flies in only 10 days in the classroom is a memorable way to experience complete metamorphosis. It can even be used for experiments. For example, when comparing fly vials placed closer to a radiator with those further away, the influence of temperature on biological processes of cold-blooded animals (including insects and amphibians) can be demonstrated. Or mutant flies of different body or eye colour can be used, thus challenging the children to spot small differences (if you need suitable flies, please contact us). Furthermore, fly maggots are drastically different from adult flies (Fig. 5) and do not even have stumpy legs like caterpillars. This poses the obvious question of what actually happens within the pupal case. In flies this question has been answered in unprecedented detail. Building on this knowledge and supported by graphic illustrations and little films, we show how muscles of crawling maggots are rebuilt to enable walking and flying, and how legs and wings are formed anew. Notably, pupils also learn that tongue development in frogs occurs during metamorphosis in ways comparable to leg/wing development in flies. We were surprised to find that only a few kids could identify mosquito larvae (a common and easy to spot guest in puddles and buckets in our gardens! ), but many knew malaria as a mosquito-borne disease. Accordingly, pupils appreciated the life cycle of the malaria parasite Plasmodium, which starts in humans and then continues in mosquitoes. For this, I provide a step-wise animation which makes it easy to explain the enormously complex Plasmodium life cycle. The lesson leads over to parasitic worms and the example of the tapeworm life cycle is briefly discussed (Fig. 6), which tends to have a gripping “horrible history”-like effect on the pupils. Importantly, the life cycles of both parasites represent relevant examples relating to disease: Plasmodium illustrates the importance of malaria prophylaxis (for kids travelling into malaria-infested areas) and the tapeworm clearly illustrates why we should wash our hands after being outside. Fig. 6. 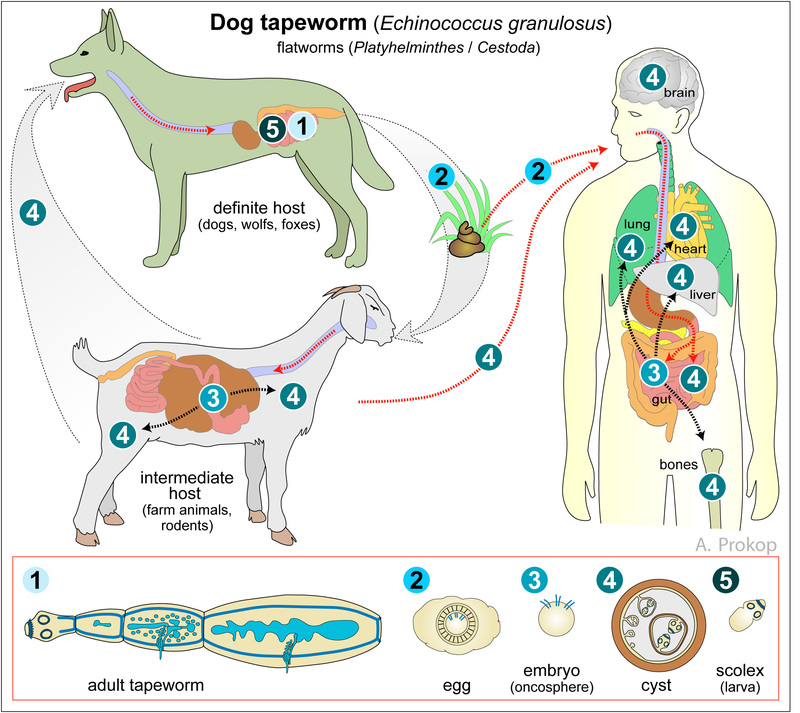 The dog tapeworm: an unusual but didactically valuable example of life cycle, relevant for understanding needs of daily hygiene. For details see our website. (11) pose the question of whether we can study ageing in a fly that only lives for 7-8 weeks; test this with an experiment racing young against old flies; data are plotted and then discussed in front of the class to show how data can be generated and interpreted. The flow of our evolution lesson is summarised in Box 3, and most contents are explained on our accompanying webpage (Prokop, 2018a). One innovative aspect is the introduction of “binominal nomenclature“, i.e. the two-name naming system of animals, plants and microbes (such as in “Tyrannosaurus rex”). Its underlying concepts are explained with engaging and surprising examples (e.g. the “pomato“). The lesson uses binominal nomenclature as a gateway to an understanding of animal classification (covering items 4 and 5 in Box 1). Using fruit flies offers unique and unusual opportunities for evolution lessons. For example, we use so-called “marker mutations” affecting the flies’ body colours, eye shapes & colours, wing shapes, or bristle shapes & numbers. These changes to the flies’ anatomy are easily spotted by young kids under the microscope (Fig.7; for info about cheap microscopes, please contact us, or if you prefer to perform the experiment with digital images). We then capitalise on these mutations by constructing step-by-step an invented evolutionary tree (Fig.8). This is intended to bring home to the pupils how random mutations can provide opportunities and be selected for, leading to new species over time. The fact that fly research has helped us understand human disease (Fig. 9), is a fantastic starting point to think about the concept of “deep homology”. The idea behind this concept is that flies and humans shared a common ancestor organism about 500 million years ago. This ancestor had many aspects of biology readily established, which were so fundamental that they have been maintained in the many life forms that evolved from it. Fig. 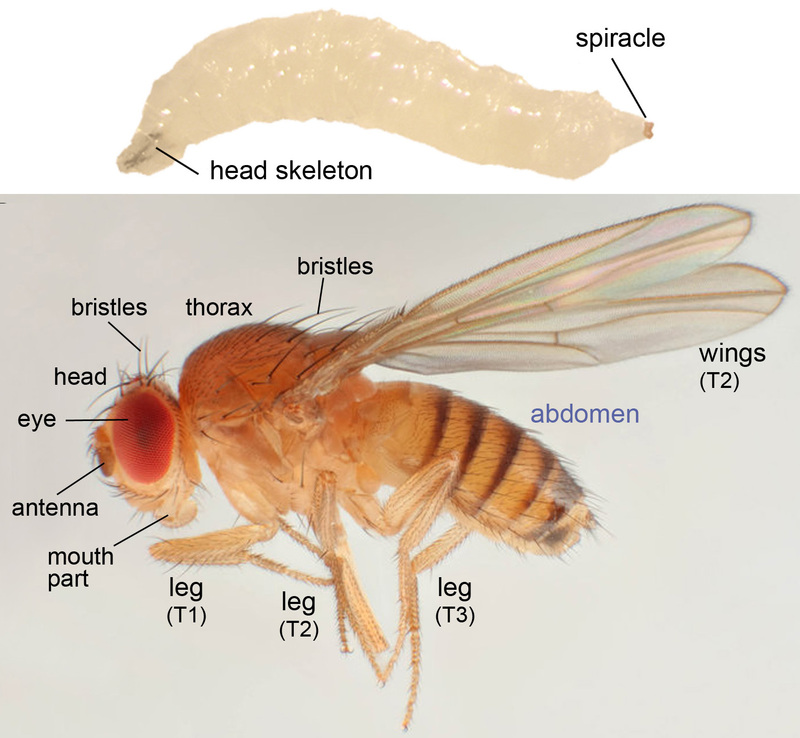 9 Examples of related fly and human genes which cause comparable defects when functionally affected: loss of Pax6 causes blindness/eye loss, and gain of hedgehog (Shh) causes extra digits/wings. Note that functions are so well conserved that the Pax6 gene from mouse can cure the defect of flies and bring back its eyes. Images taken with permission from: Washington et al., 2009, PLoS Biol 7, e1000247ff. ; www.primehealthchannel.com/polydactyly.html; Tabata, 2001, Nat Rev Genet 2, 620ff. We capitalise on the concept of deep homology by finishing up with a simple, yet highly memorable experiment. Pupils are asked whether they would win a race against their grandparents, to then discuss what happens to our bodies during ageing (item 5 in Box 1). Pupils then vote as to whether they think that a fly life of 7-8 weeks is long enough to show symptoms of ageing – i.e. whether we can study ageing in flies. We take this to the test in that pupils perform a race experiment: flies have the tendency to walk upwards in their vials; so pupils bang them down and measure the time at which the first young and the first old fly arrive at the top (referred to as the “climbing assay”). Data are collected across the class and plotted live in front of their eyes. Pupils quickly see that young flies are faster, thus discovering the answer to the question of this experiment. We discuss the obtained “data clouds” as being typical of biological experiments; pupils are then usually able to suggest that means/averages are a way to describe these data and turn them into bar graphs. Epilogue: How well do these lessons and their objectives work in practice? For several years, we have taught various parts of these lessons in higher classes of primary schools and lower classes of secondary schools. On 17 October 2018 we were invited by St. John’s RC Primary School in Manchester to teach both lessons in parallel in two consecutive sessions: first to two year 5 classes (aged 9-10), then to two year 6 classes (aged 10-11). A team of four took on the task (Fig. 10), for which we brought 25 low-cost stereomicroscopes (for looking at mutants), flies and empty vials (for the climbing assay), as well as the various activity and evaluation sheets. Ahead of the event, teachers had watched our 5 minute educational movie together with the pupils, to introduce them to Drosophila as a laboratory model, and had observed vials with fly eggs for two weeks to protocol the fly life cycle (Fig. 10). Fig. 10 Left: The team visiting St. John’s RC Primary: Andreas Prokop, Sanjai Patel, Megan Chastney, Ben Chapman. Right: Class display illustrating engagement with the fly vials provided 2 weeks ahead of the event. The flow of lessons during this first comprehensive trial worked in a highly interactive manner, with pupils staying alert. The evaluation forms were filled in with the help of teachers on the following day and turned out to be very encouraging (Fig. 11; Box 4). Most pupils seem to have enjoyed the event and felt they had learned new facts about animals, life cycle and evolution – suggesting that our ideas are in principle working and can reach year 5 and year 6 pupils. This said, the level and amount of selected contents was intended to be demanding, and proper implementation for routine use in schools would require suitable differentiation strategies to reach children of varying abilities. Furthermore, the evaluation only reflects what the pupils felt; it would require more detailed studies to assess whether this correlates with true learning, and follow-ups would be needed to investigate long-term retention. Fig. 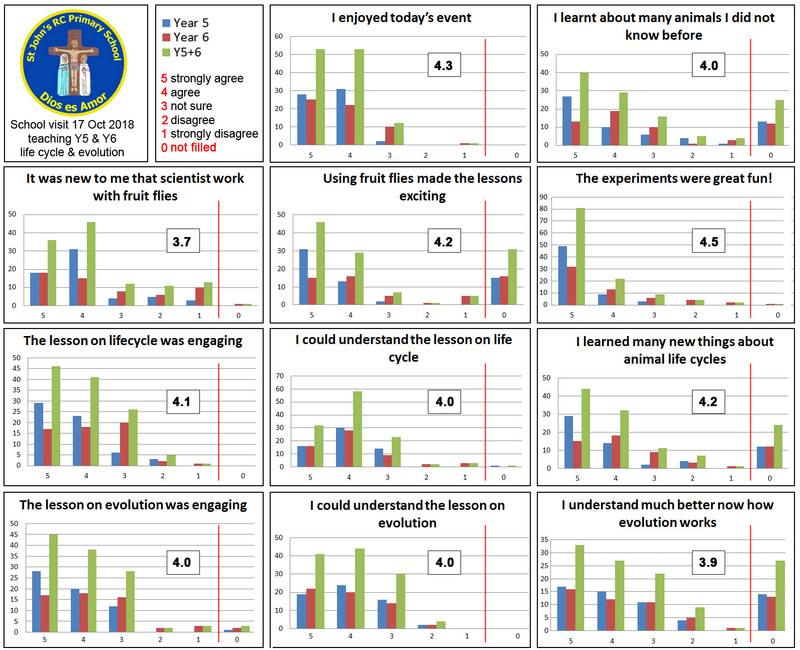 11 Evaluation of the event on 17 Oct 2018 teaching the Life Cycle and Evolution lessons to Y5 and Y6 classes at St. John’s RC Primary School in Manchester. The complete spread sheet can be downloaded here. To facilitate retention, we designed further strategies and resources. Thus, children were given three activity sheets (LINK1, LINK2) designed to be filled in with the teachers in school or as a homework task (potentially engaging further family members! ): (1) an aide-mémoire which was filled in during the lesson and displays different insect orders and whether they have a pupal stage; (2) a sheet explaining the UC Berkeley BioKeys activity; (3) a crossword puzzle as an incentive to look at the accompanying website (Prokop, 2018a) and our 2nd educational movie. However, to achieve that these resources serve their intended purpose of consolidating knowledge, we are aware that schools are busy and that we need to develop clever strategies of incentivisation and closely collaborate with teachers to make sure that these resources are being capitalised on. Finally, regarding the aims of our droso4school initiative, most pupils found that flies and the fly experiments were great fun and exciting (Fig. 11, Box 4), suggesting that flies seem to work as suitable teaching tools also in primary schools. For the majority of pupils it was new that fruit flies were used in research, and disagreeing students might have known from hearing about our previous events at the same school. But from their comments we take the careful hope that many of these kids will remember Drosophila in the future, and that the experiences of this extracurricular day will make them respond with greater attention and curiosity when hearing about fruit fly research from the media or elsewhere. To extend this outcome beyond Manchester, we made all our teaching resources public and are working hard to spread their active use within teacher and researcher communities; comments that we received on other lesson resources from across the world show that this is in principle possible (see our impact document). However, the impact could be even greater if examination and education boards incorporated Drosophila into the national curriculum – and this is what we are aiming to achieve (see also Prokop, 2018c)! About the author: Andreas Prokop is Professor of Neurobiology at The University of Manchester. As academic head of the ‘Manchester Fly Facility’ and together with the facility’s manager Sanjai Patel, he drives the “Manchester Fly Facility” and ‘droso4schools‘ initiatives mentioned in this blog post. What role do sexual versus asexual modes of reproduction play in plants and animals. The horticultural practice of grafting is also explained in this context. How do different plant or animal species distribute gender? For example, hermaphroditic snails or earthworms in our garden are male and female at the same time, or clown fish can change gender from male to female. How does the reproduction of plants and animals compare to that of bacteria or baker’s yeast? How do life cycles link to evolution? In this context, the example of the peppered moth is explained and the relevant topic of bacterial resistance to antibiotics is explained. 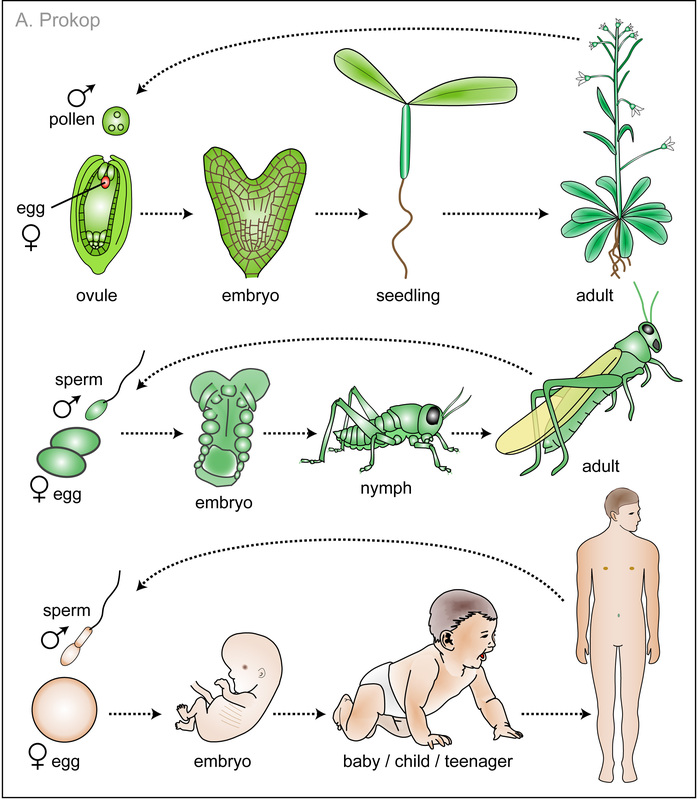 What is development and how does it relate to the topic of reproduction and life cycle? The information about these five insect orders also covers typical features of their aquatic larvae typically occurring in our ponds or rivers (Fig. 5). This might be helpful for an outside activity. Fig. A1 Embryonic and juvenile development. For further details see our website.